Driving back from Park City, where Brenda Mallory’s second exhibition at Julie Nester opened July 5th, the familiar but still disturbing sight of an elk lying dead on the median strip of I-80 brought into sharp focus the universal significance of the artworks just seen. Once broken, nothing in this world can ever be made whole again: never be put back together exactly as was. Cracked, bent, torn-and-repaired, objects whether naturally occurring or man-made, even our ideas and opinions, and especially including ourselves, gradually give way to experience, until the patina of use and abuse marks the departure into old age and dissolution. On the other hand, everything that exists has been reassembled from previously-used fragments arranged and—in the jargon of our age—repurposed from shards. What Brenda Mallory’s quiet-spoken, eloquently accumulated constructs demonstrate, as they explore the narrow zone between two-dimensional designs and three-dimensional structures, are the only way anything can become new again. 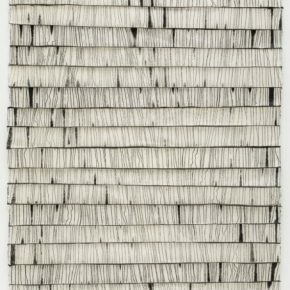 Mallory’s preferred materials are handmade papers, cloth, wax, fiber, strings, and ink, with which she produces lines and surfaces for them to articulate. Her most characteristic objects are clusters of vessels that aggregate ambiguously on a wall—part natural populations, part fabricated clusters. In much of her earlier work, these often evoked winged creatures or pollen-producing plants. Even in the presence of metal screws and rods holding them together, these flocks and bouquets, with their vivid veins and segmentations, overwhelmingly suggest organic matter, structure, and process: tubes, leaves, membranes, and what might be constructed with them. A few works in the current show continue this approach. 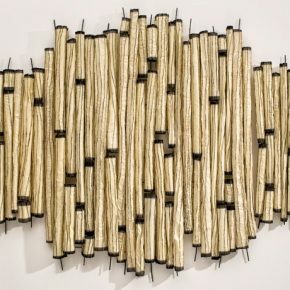 In “Interrupted Forms” we see an array of tubes from the outside, and their progress across the wall can be read several ways, such as by surrendering to the pictorial illusion that those longer forms in the center are closer, animating the ensemble and, as the word suggests, lending the whole a lifelike energy. In “Variable Order,” on the other hand, we see the insides of tubes that have been split in half lengthwise, their black edges and machine screws the only contrast to their glutinous white membranes. 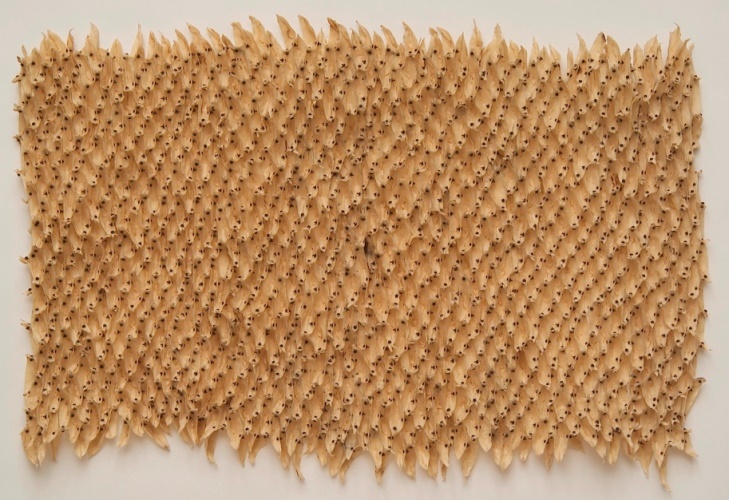 Some of these fabrications remain on the gallery’s website, while one still hangs in an adjacent room. They combine highly specific suggestions with archetypes both mechanical and organic, in ways that argue for continuity across what are commonly taken to be exclusive domains. Viewers familiar with the oddly appealing affect of Steampunk might feel a similar charge here in the pleasure of her inventions, as much aesthetic as practical. Recently, though, Mallory’s thinking and expression have broadened, taking on more of the metaphorical and even allegorical implications of the working methods that draw her on. At first sight, the resulting works resemble prints or drawings, and indeed some of the raw materials came from those sources, which produced the patterns of lines that were then cut apart and put back together in inventive creations. The materials are the same as were employed in the constructions, with the primary difference lying in the new works more shallow relief. 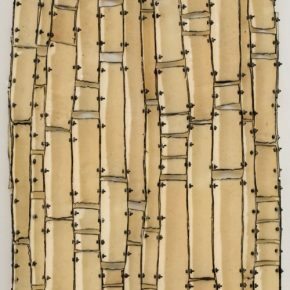 The wittily-titled “Warm Lines 1, 2, & 3″ were stitched in chenille: French for ‘furry caterpillar’ and familiar to Americans primarily through ornamental bedspreads. 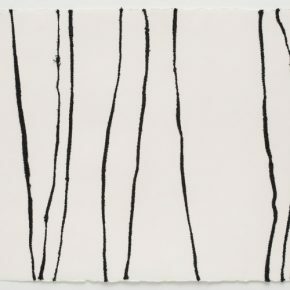 Mallory’s lines, however, are stitched into stiff paper instead of pliant cloth, and vary in width and weight as they cross and recross over each other and cascade from one panel to the next. 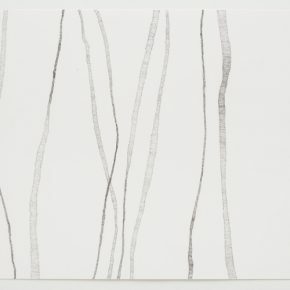 “Drawn Lines 1, 2, & 3” transform this visual look into straight pen-and-ink: the same process of reconstruction translated from material to thought . . . and back again. I have been working with thread and line as a metaphor for life and life’s interruptions. Often the damaged and repaired line is more beautiful than the pristine line. The necessity of repair, the evidence of the struggle, the healing act of pulling order from chaos: these are the acts and images I want to see. For anyone weary of a damaged and wounded reality, there is good news in the realization that it can be made not only new, but in the process, better. Brenda Mallory is exhibiting in a two-person show with Tor Archer at Park City’s Julie Nester Gallerythrough July 22.